Nicely done and well named! Congratulations on your latest "Recipe!" This is fabulous. I shall go and take speak on the Moda website. See! 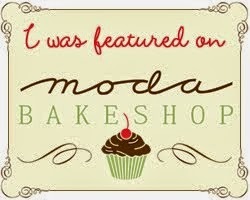 You came up with a great name...Im going to brag all over the place that I know someone famous enough to be featured on Moda Bakeshop! This is a beautiful pattern and I love the fabric you chose. Made my way here from Moda Bake shop. Okay my first word for verification is "moda". Seriously. Oh wait maybe it's really "nnoda"
Hi! I just found your blog and love it! I have a pile of Salt Air at home - love this line! Your quilt is gorgeous - I'm going to check out your tutorial. So glad I found you! I've been looking for my first quilt and I think this is it! I'm not quite sure how to find the fabric, though. There are some shops where I live that carry Moda but I have a feeling the fabrics in a jelly roll will be hard to find. Would it be better to order online to know for sure I'll get everything needed instead of going on a wild goose chase? It's beautiful and I'm inspired! I just posted about this! Love the tutorial! thank you! I just made this quilt using your tutorial on Moda Bake Shop. Love it and Thanks so much for your wonderful tutorial.